The Mission Statement of the Cathedral Church of All Saints’ is based on Our Lord’s summary of the Law, “Hear O Israel, The Lord our God is one Lord; and thou shalt love the Lord thy God with all thy heart, and with all thy soul, and with all thy mind, and with all thy strength. This is the first and great commandment. And the second is like unto it, thou shalt love thy neighbour as thyself. On these two commandments hang all the Law and the Prophets”. The Cathedral Vision spurs the congregation to compassionate service, advocacy and justice building as we accept the challenge of Outreach. Cathedral clergy and lay members of the congregation strive to implement this vision in our immediate and wider community. We place a high value on working to extend our circle of active involvement, and communicating with partners to guide our prayerful efforts and recommendations to Council. Approaches to Outreach incorporate both a ministry of presence and financial support. 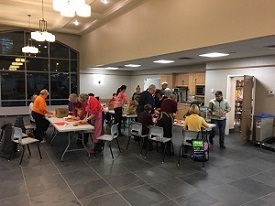 Clergy and lay members of the congregation of all ages currently prepare meals and serve at St. George’s Soup Kitchen five times per year. At the Out of the Cold Shelter for persons experiencing homelessness we provide lunch and breakfast one day a week from November to April. Various other activities undertaken by laity in combination with Clergy pastoral duties serve to strengthen and enhance Cathedral Outreach through Ministry of Presence. Rev. Maggie Whittingham-Lamont serves as Chaplain at the Halifax Mission to Seafarers, part of a worldwide network of Anglican supported Missions. The chaplaincy is an interdenominational ministry of practical, emotional and spiritual support to all seafarers passing through our port city. Financial support and Christmas boxes for seafarers also form part of our Outreach. Rev. Dr. Helen Ryding regularly ministers to residents at Metro Non-Profit Housing, and members of the congregation assemble and deliver gift bags at Christmas. Amongst other pastoral and Outreach activities, Rev. Ryding presides monthly at St. Vincent’s Nursing Home Communion services and ministers at Hope Cottage. Countless agencies throughout our region implement unique mandates in responding to the needs of men, women and children in need of material and spiritual support. Currently the Cathedral is making a financial contribution to the work of at least a dozen of these organizations, including those listed in the column to the left. We believe good stewardship in financial ministry requires ongoing assessment and review, in the context of our Vision, of both the ministries we engage directly and those we choose to fund. Donate to the cathedral using PayPal™.